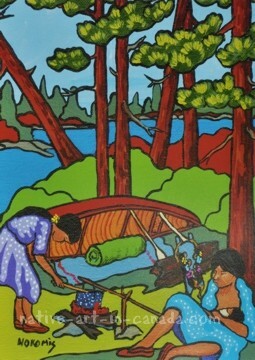 Camp Here Tonight is a painting by the Ojibwa artist Nokomis. "We're going to camp here tonight," were the words that signaled that in our Ojibwa culture it was my turn to work. That's because when we were in the canoe it was my Mom who did most of the paddling. I was expected to paddle too, but I couldn't keep it up hour after hour but I did a good job of pretending. Just before the sun set Mom would tell me to catch a fish. In those days we carried a short line tied to a stick. Bait could have been anything...a bug, a piece of bacon or even bread and the fish practically jumped into the canoe themselves. When we made camp Mom would pull the canoe onto the shore and if the weather was nice simply prop it up with a paddle so that later on she could throw a tarpaulin over it to create a make-shift shelter. When I was very young (preschool) she would also fillet the fish and start the fire for me but even at that age I was expected to cook the meal. In those days I always made a fish soup. My recipe was simple. I pulled bulrush from the water and chopped up the tender white stocks and root. Then I put the fish and bulrush into some water and waited a few minutes until it cooked. It was many decades later that I learned that there's twelve times more vitamin C in a bulrush than there is in a single orange! It didn't matter how long the trip was, when the sun was about to set my Mom would say, "We'll camp here tonight" and I knew what I had to do.